At least 28 people have been killed and nearly 100 others wounded in a bomb attack in the Turkish town of Suruc, across the border from the Syrian town of Kobane. The explosion may have been caused by a female suicide attacker, officials say. The blast targeted a group of young people who planned to travel to Kobane to assist with rebuilding. Kobane has seen heavy fighting between ISIS militants and Kurdish fighters. Turkish authorities believe ISIS may be responsible for the attack. Turkish President Recep Tayyip Erdogan has condemned the bombing and described it as “an act of terror”. Suruc houses many refugees who have fled the fighting in Kobane. ISIS overran the Syrian town in September last year, but it was retaken by Kurdish forces in January. 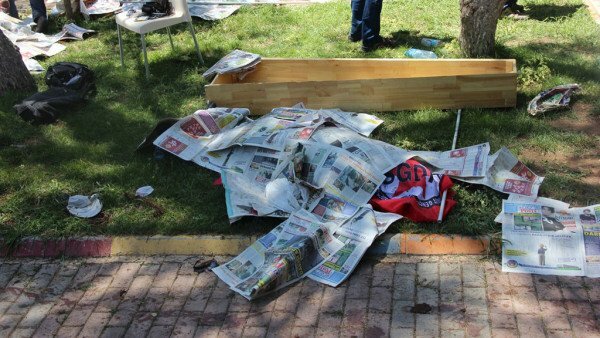 The Federation of Socialist Youth Associations (SGDF) is reported to have had at least 300 members staying at the Amara Culture Centre in Suruc, where the explosion happened. A photo taken earlier in the day showed members of the group relaxing in the garden. A video released on social media apparently showed the moment of the blast. Then an explosion rips through the assembled youngsters. Images of the aftermath show bodies littering the ground, with the red flags being used to cover them. The hashtags #SuruçtaKatliamVar (There is a massacre in Suruç) and #SuruçMassacre started trending on Twitter soon after the explosion.